The Suez Canal Authority is presently engaged on a two-phase development p r o j e c t which, if completed, will involve the expenditure of at least $1,200 million over the next six to seven years. Roughly half of this amount is to be financed from Egypt's reserves of foreign currency, and to date the Canal Authority has negotiated $503.3 million in foreign loans. Can such expenditure be justified? "The Suez Canal and its Impact on Tanker Trades and Economics," No. 62 in a series of shipping studies issued by HPD Shipping Publications, in considering this question, raises serious grounds for doubt. 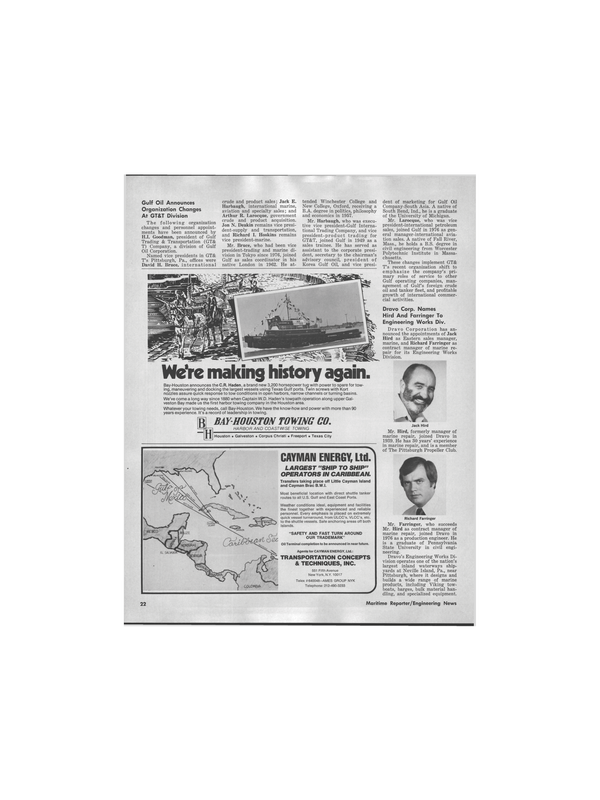 In the study, the volume and distribution of tanker traffic through the Canal at the height of its popularity in 1966—the last full year before the waterway was closed due to the Middle East war—is contrasted with that following the reopening of the Canal in 1975. The contrast is as startling as it is informative: In 1966, it is estimated that of the total potential volume of oil available to be routedvia the Canal, 74 percent (or 175.6 million tons out of a total potential trade of 236.6 million tons) actually transited via Suez. By comparison, in 1976 just 5 percent of all inter-area oil movements potentially available for movement via the waterway actually used this route. In terms of distribution, the pre- and post-closure figures are equally revealing. The Arabian Gulf to Southern European and Mediterranean route has now superseded the Gulf to Northern Europe route as the major trade for tankers using the Canal. Indeed, from a tracking analysis, it has been estimated that Southern European and Mediterranean destinations now account for 70 percent of all northbound oil tonnage transiting the Canal. This reordering of the volume and distribution of oil traffic through the Canal reflects the enforced changes in the world tanker fleet structure following the 1967 closure. At that time, 95 percent of the tanker fleet were able to transit the Canal in a full or part-laden condition, with 72 percent capable of fully laden transits. Today, only 17 percent of the fleet can use the Canal in a fully laden condition, and the economies of scale offered by the use of VLCC and ULCC tonnage utilizing the Cape route has seriously undermined the competitiveness of the Canal, with its present draft restrictions. The proposed development of the Canal, intended to be completed by 1983-84, will eventually allow the passage of 260,000-dwt tankers fully laden, with tankers of 300,000 dwt able to transit part-laden. On the basis of the existing fleet and newbuildings planned for delivery by 1980, these improvements will allow 66 percent of the tanker fleet to transit the Canal fully laden. However, as the detailed costing analysis contained in the study demonstrates, where there is a way there may not always be a will. The economic analysis in the study embraces several ship sizes, with their transportation costs calculated both on the underlying cost of ship operations and on the rates prevailing in the market (both a "low" and "high" market position are considered). The analysis concludes that the economic benefits resulting from the use of Suez rather than the Cape depend upon the major variables of tanker size, the distance saved by using the Canal, and the level of rates in the tanker market. With the present tanker surplus in excess of 100 million dwt, the planned expansion of the Canal would serve only to prolong the disequilibrium between tanker supply and demand, and so extend the period of low tanker freight rates. In such a market situation, the ability to attract large tonnage through the Canal would depend on the Authority's willingness to accept a low level of Canal dues. The existence of the SUMED pipeline (considered in the study) further complicates the issue by detracting from the total potential traffic available for the Canal. In view of these comments, it is open to doubt whether Phase Two of the Suez expansion scheme makes any economic sense, and whether such a development can ever generate the revenues needed to pay for its costs. Both the Egyptian national economy, and the world tanker industry might be better served by the abandonment of all Suez expansion after the work now in hand has been completed. "The Suez Canal and its Impact on Tanker Trades and Economics," No. 62 in a series of reports on various aspects of shipping, prepared by the Research Division of HPD Shipping Publications, 34 Brook Street, Mayfair, London W1Y 2LL, England, is available at a single copy rate of U.S. $85 (all overseas orders) or £35 (U.K. only) or on a subscription basis U.S. $325 (all overseas orders) or £135 (U.K. only) for the series 61- 70.